The OSS Smatchet was the brain child of William Fairbairn, who took the features of a bolo knife and a hatchet and combined them to create a knife that was carried by both the Officers of Strategic Service and the British Special Air Service. Originally, the smatchets creator intended this little blade to be for combat and nothing but, although years of use in the hands of collectors and soldiers have seen this blade put to dozens of effective uses beyond typical combat. This smatchet features a broad, leaf-shaped blade with a tapered point, allowing it to excel at thrusting, cutting, and hacking. The blade is made entirely from high carbon steel that features a blued matte finish, to help reduce reflection and glare, preserving the original knifes stealthy look. The blade is honed to razor sharpness on one side, while only a third of the blade is sharpened on the reverse. The grip features a full-tang construction for added strength, while also possessing a close-grained hardwood grip that is held in place by two big rivets. The end of the smatchet features a cast aluminum pommel that features a small lanyard hole. The smatchet comes with a black leather sheath with an angled belt loop. The blade measures approximately 11 inches long, while the knifes overall length is closer to 16.75 inches. 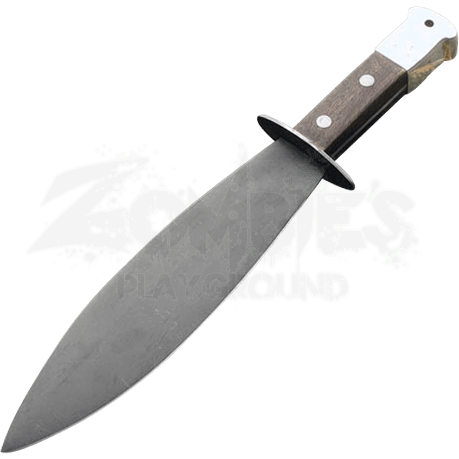 This was the knife that saw many British troopers and soldiers through some of their worst times during World War II, and that makes this OSS Smatchet a great collectible to add to your armory, as well as a great belt knife to include in your attire when you want that authentic soldier look (or when you want to have a righteously awesome and extremely useful knife at your side). Overall Weight: 1 lb. 8 oz.